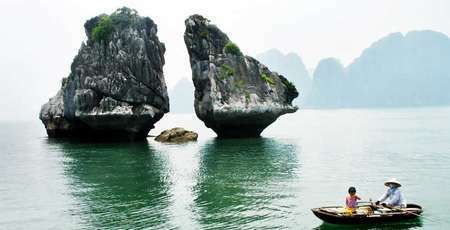 Ha Long is compared as a giant lively ink painting with thousands of monumental islands. This magical result of nature has been recognized many times as the world's natural heritage which is truly ideal for sightseeing or exploring the spectacular natural sceneries here. Location: Located in the West Bank of the Gulf of Tonkin in the North East Coast of Vietnam, 170 km from Hanoi. 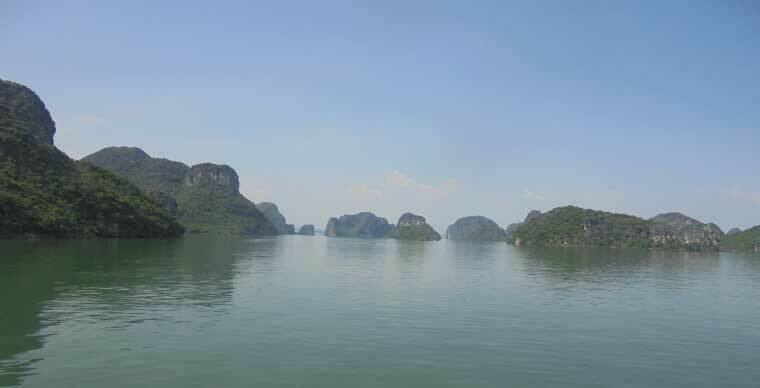 Halong Bay has a total area of 1553 km2 including core zones, buffer zones including 1969 large and small islands of which 989 named islands and 980 unnamed islands. Ha Long City is a coastal climate with two distinct seasons each year, winter from November to March, summer from May to August. The average annual air temperature is 23.2ºC; The highest is June (28.6ºC); The lowest is January (16.7ºC). 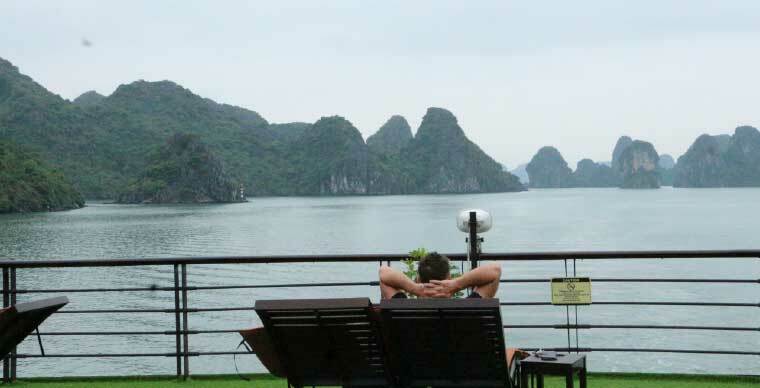 For domestic visitors, they often travel to Ha Long in the summer, from May to July. Foreign tourists prefer to go in the winter, starting from November until Tet holiday in late February. 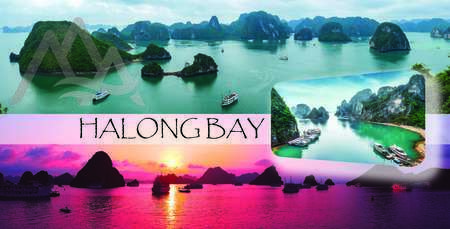 Objectively, the best time to visit Halong is in the autumn, from August to October. In addition, Ha Long from April to May is also lovely. If you go to Ha Long from June to July, there may be storms striking the North. When it rains, the scenery on the bay will be more bleak, the sea can be prohibited that cruise ships can not take the guests to spend the night on the bay. Autumn in Ha Long is nice. It’s sunny from September to November, the weather is still not to cold and there are less storm during this period of time. Bus: At present, at all bus stations in Hanoi such as My Dinh, Nuoc Ngam, Giap Bat ... there are coaches to Ha Long with the first departure at 6:00 am and the last at 17:00 pm (journey takes 3-4 hours). The ticket price for the seats is 100,000 VND ($4.3) and the beds is 200,000 VND($8.6). - From Hanoi, along 5 Street to Sai Dong head to Bac Ninh, from Bac Ninh, along 18 Street to Pha Lai - Chi Linh - Dong trieu - Uong Bi - Ha Long. Total distance is about 155km. Seaplane: Currently, besides the usual means of transport, Ha Long Bay tourists from Hanoi also have new options with the modern seaplane of Hai Au Airlines.This great experience helps you capture the memorable moments of Halong Bay from 150 to 3,000 meters above sea level. Ha Long bay is bestowed with many of mysterious poetic and unique caves. Each cave of Ha Long has an interesting name, suggesting visitors curiosity to explore such as Động Thiên Cung ( Heavenly Maisons Cavern), Hang Đầu Gỗ (Wooden Head Cave), Động Mê Cung (Maze Cavern) , Hang Sửng Sốt (Astounding Cave), Hang Trống (Male Cave) và Hang Trinh Nữ ( Maiden Cave). - The beach on the famous Ti Tung Island offers stunning views. - The beaches and more beautiful: Ngoc Vung beach, Quan Lan, Minh Chau, Ba Ba Dao. 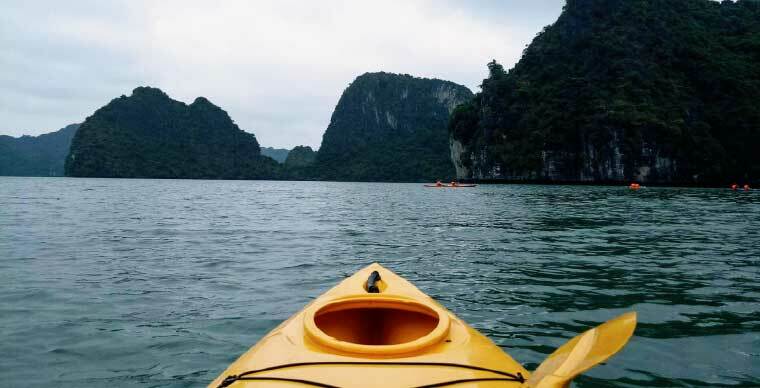 Halong Bay has been rated by National Geographic Adventures as one of the top 25 Kayak Tours in the world. In Halong there are many places for renting Kayak (at the tourist pier, islands), the rent from 100,000VND ( to 200,000 VND / hour depending on type of boat 1, 2 or 3 seats. 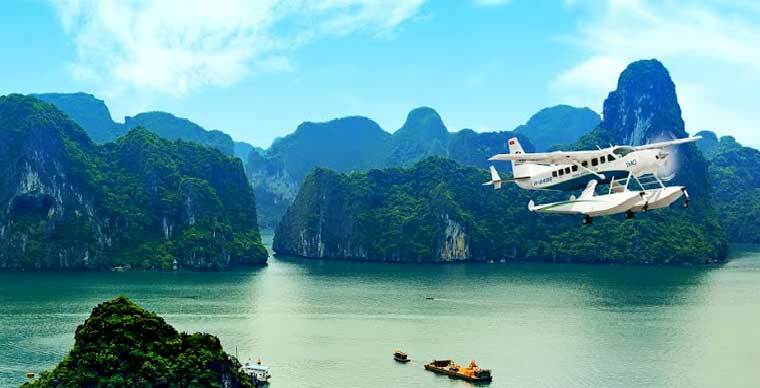 Airplane with 2 seats for pilots, 12 seats for passengers and spacious windows allow passengers to enjoy the beautiful view from the plane and capture the memorable moments of Halong Bay from the elevation of 150 to 3,000 m above sea level. The New York Times magazine also voted sightseeing in Ha Long Bay from seaplane as one of the most attractive tourist services in 2015. What is so great about welcoming the new day to see the dawn on the sea and when the night falls down, doesn’t being immersed under the starry sky in the vast sea feel great? The cruise liner is like a small, comfortably furnished hotel that offers a unique and romantic experience on the sea. The coastal fishing village in Ha Long is a peaceful and quiet place, an interesting stop for tourists. Destination for this experience can be Van Halong Fishing Village in Vung Vieng fishing village, Cua Van fishing village, Ba Hang fishing village. You can rent a skiff right at Halong pier. If you are a follower of this adventurous sport, probably the thorny cliffs, the gloriously gliding curves of the mountains, the cliffs, caves in Ha Long Bay will give you a sense of longing to conquer. The new recreational tourist destination Sun World Ha Long Park has an area of 214ha, is a complex of a world class amusement park. Besides, you can also visit the Quang Ninh Museum, or take spiritual tours around Halong Bay such as Ba Vang Pagoda, Yen Tu Monument. In order to meet the needs of millions of visitors each year, Halong City offers a myriad of choices of restaurants, hotels, and entertainment and dining options to suit all kinds of guests with different interests. Hotels in Ha Long are arranged in different clusters, each of which are available for renting and specific subjects as follows. Ha Long Road is the area where many luxury 4 or 5 star hotels with nice view to the sea. As a result, room rates are much higher than other areas. It’s 1.000.000VND ($43) at least for each room and can be much higher during holidays. Compared to the area of Ha Long street, the Navy T-junction has many hotels with prices ranging from 200.000-300.000 VND ($9-$13) per night. On weekends or holidays, the prices may rise about two to three times higher. 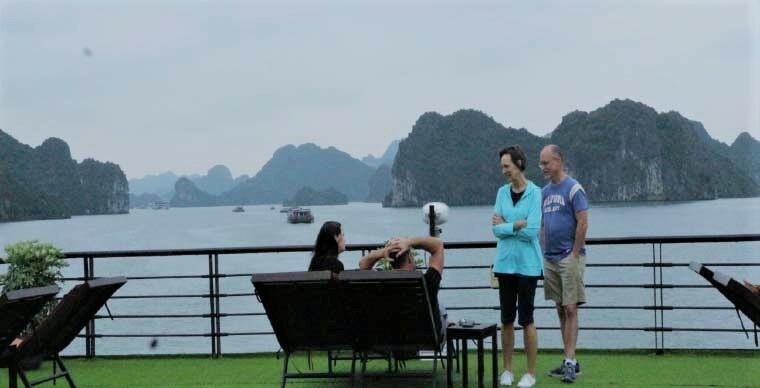 Like the Hai Quan T-junction, Vuon Dao area also houses many low-cost hotels in Ha Long with prices ranging from 300.000 VND - 700.000 VND ($13-$30) per night. Prices may vary from time to time. Ha Long tourism in particular and Quang Ninh tourism in general not only immense sea but also a lot of special culinary specialties, bearing the salty taste of the sea. All the best to your trip to Halong!